Today, Adriana Harlan of Living Healthy with Chocolate lives a life free of inflammation, no longer having sugar cravings nor hungry every three hours like before because she now knows exactly what foods best nurture her brain and body. Being paleo and gluten free for years, this is a statement that attracted me to this woman and her progress leading her to the success she now carries, also helping many others. In her late 20s she started developing stomach and joint pain and was desperate to find a solution, yet was confused about what exactly healthy foods were and ultimately which foods would best nurture her own body. She found what worked and never looked back. 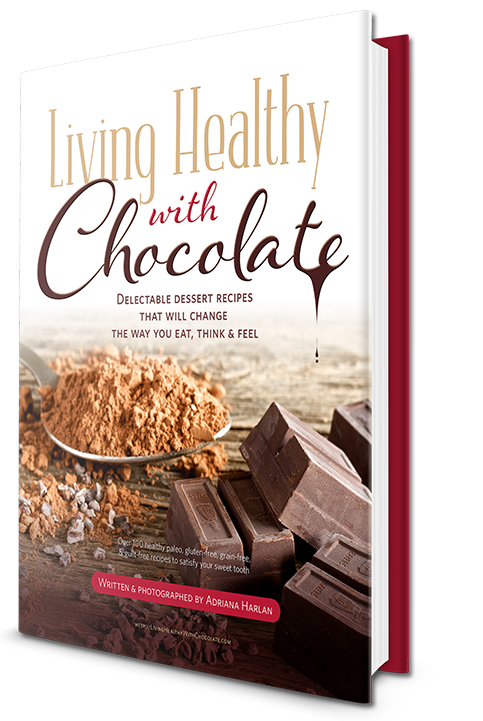 Let’s dig in and get to know Adriana and see what she says to shed some light on some interesting topics for us in my in-depth interview with the author of the amazing, Living Healthy With Chocolate. 1. You were born and raised in Brazil. Did you find the foods and health beliefs different from that of those in the United States? Growing up in Brazil was certainly different. I remember the first time I ever saw packaged and microwavable foods at the supermarket. I thought to myself that this was a great time saver for busy people like my friends and busy parents. But then I also began to wonder how these packaged foods could last so long on the shelves and what ingredients could be used to extend this shelf life. I grew up eating meals that were cooked from scratch everyday. My mom made sure everything we ate was nutritious and fresh. Food was cheap and grown on green pastures around the country. Fruits and veggies are sold in the street markets daily and unlike America, the healthy foods in Brazil are cheap and the fast food is expensive. 2. You are living now in my home state of Hawaii. I love to go hiking out there in the amazing weather whenever I’m there. What made you decide to move and what do you enjoy most about living there on the Island of Oahu? Since I was little, I was fascinated with America and the language. I was fortunate to have been able to travel to a few states during my teen years and I knew one day I would call America my home. Choosing Hawaii as my new home was easy since the weather is so nice and the waves are like no where else in the world. 3. You mention that as a child you were overweight in your teen years, then your parents took you to a nutritionist. Are or were your parents into nutrition and living a healthy lifestyle or was this more your own idea? My whole family was very healthy and active all the time. My father and I however, had a serious addiction to sweets, especially chocolate. When I was 13 years old, we began to notice my weight increasing and my mom thought it would be a good idea to control the situation. She asked me what I thought about seeing a nutritionist and I knew she was right. How could I possibly eat that much chocolate for the rest of my life and stay healthy? This was just not possible and I knew I had to control my cravings and learn about nutrition. This was one of the best decisions I’ve made and to this day I still follow some of the tips I learned from my doctor. One, for example, is to eat slow and chew your food very well. 4. You mention you feel doctors are teaching incorrect ways of “losing weight”. What are some of these ideas that are being taught that you feel are false and why? To me, one of the biggest misconceptions is the concept that calories will make you fat and counting them will help you stay in shape. To me, calories from different foods have very different effects on your metabolism. For example, 100 calories of a piece of grass fed steak is not the same as 100 calories of a piece of cake. The healthy fats and protein from the steak will fuel your body with nutrients, will keep you full for much longer and will not affect your hormones like the piece of cake would. 5. In your late 20s you began to experience extreme stomach and joint pain that you since handled through diet. What was your workable solution to this and how did you discover it? One of my first real eye opening experiences to healthy eating was from the book Deep Nutrition: Why Your Genes Need Traditional Food by Dr. Cate Shanahan. This book completely changed the way I thought about food and how the foods we eat impact our bodies. After reading this book I began to look very closely at my diet and realized I was far from where I wanted to be and knew I could stay away from prescription medicine and cure my stomach and joint problems through healthy eating. The other book that helped me get to where I am today is Good Calories Bad Calories by Gary Taubes. Switching to a low carb diet and cutting out all the sugar, processed foods, vegetable oils and grains in my diet was a major step forward and today I am free of those debilitating joint and stomach pains I had for so many years. 6. Your dental health improved with Paleo. Can you tell me a little about that and what your views on this are? As I mentioned before, growing up I was a sugar-holic. I was constantly dealing with cavities and fillings at every dental visit. This was another issue I was determined to figure out and once I eliminated the foods I mentioned in the last question my dental health improved dramatically. I have been cavity free since 2009 and my dentist is amazed! It just goes to show you that you can improve your health by avoiding the modern, processed foods that are so toxic and void of nutrients. 7. In your amazing eCookbook, Living Healthy with Chocolate you found ways to incorporate good, healthy ingredients into delicious, healthy chocolates and treats. What are some of your favorite ingredients that you found are nutritious substitutes in your eBook? Thank you for the kind words about my book. I was so pleased about how it turned out and I think people who buy the book realize they do not have to deprive themselves just because of a certain diet they are on or if they think all sweets and treats are bad. I love knowing kids enjoy the desserts and don’t even know the difference and that moms no longer need to buy Oreos and Snickers Bars! Some of my favorite nutritious substitutes are almond flour, coconut oil, raw cacao and raw honey. These ingredients allow you to create amazing, healthy, tasty desserts that are packed with nutrients. 8. As many like to try creating recipes on their own in the kitchen let’s address something that is often asked of me: Do you find these ingredients are easy to work with, bake with and add the proper flavors you are going for? Do you need to mix any two natural sweeteners to achieve the result you are going for? If so, why is this? This is a good question and it is something I deal with all the time. These ingredients are easy to work with if you follow the recipes exactly as they are written. I have spent hours and hours testing different quantities and mixtures to come up with my recipes. It is also very important to use the recommended brands and products. For instance, not all almond flours are the same and I have made the same recipe with different brands and the outcome is very different. I try to use as little sweetener as possible and have not had to mix any two natural sweeteners to achieve the results I was going for. 9. Can you tell us what “benefits” these healthy ingredients have to the body, please? Well, the answer to this question could be a book on its own. To start, all of my recipes are free of grains, gluten, soy, vegetable oils and refined sugars. I make sure I use the highest quality ingredients and they are all packed with good sources of fat, protein, vitamins, minerals and anti-oxidants. These will prevent you from having sugar cravings, gaining weight and your body feeling sick. In my book, I give specifics on some of these ingredients like nuts & seeds, cacao and coconut. 10. 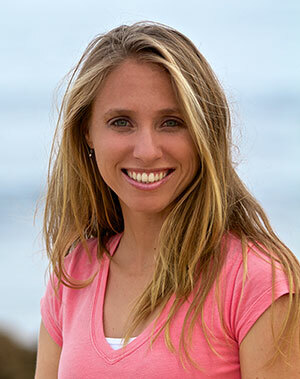 You enjoy surfing, diving and kitesurfing. You even participate in competition kitesurfing. How have you found the paleo diet has helped you as an athlete? As an active surfer and kitesurfer I am constantly getting feedback from my own body in and out of the water. After giving up sugar, processed foods, vegetable oils and grains I have seen a dramatic improvement in my recovery time after a long surf or kitesurfing session. My energy levels are higher than ever and I have also been able to eliminate a chronic knee pain I had for many years. 11. What can you share as far as you views on the importance of movement and an active lifestyle to longevity and a high quality of life? In order to live an active lifestyle we have to feed our bodies with the proper nutrients that are best suited for each individual. We also have to reduce stress, get plenty of sleep and exercise regularly for proper hormonal balance. 12. The final question I love to ask everyone: Is there anything else you’d like to say or add? I just want to close by saying I am a firm believer in the saying “you are what you eat” and that everything we put in our bodies has a direct impact on how we look and feel. I just hope people will start initiating change with their wallets because large corporations who control the food in this country have zero interest in the health of the people. If people were better educated on the foods they ate I think we would really see a shift in this country but until then the doctors and drug companies will continue to cure problems with pills and that is a sad reality. Be sure to check out my recipes to find paleo foods that keep you going and nourish you like you should be nourished. Enjoy!